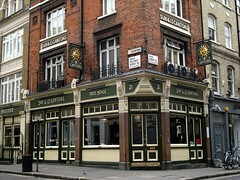 A busy pub in Soho, this is not somewhere you go for a quiet conversation. On the Friday night in April 2008 that Nick and friend visited, inside was a competition between aggregated loud conversations, the sound system fed by DJ with a pair of turntables atop the far right end of the bar, and echos of both. Outside portable barriers keep the drinkers corralled on the pavement within the frontage of the pub. At about 9pm it was just as crowded outside as in, although by 10pm it was quietening down. The bar has no handpumps, but did have London Pride on one of the taps (albeit not that great, and served as cold as the lager). The lager choice was better, with (at least) Staropramen, Stella Artois and Peeterman Artois on tap, and many varieties in bottles. On Ewan's visit in February 2009, it was pretty busy at 8pm on Saturday, though there were some tables available upstairs. It was still very loud. There is a downstairs bar as well, with low ceilings and a small bar offering a selection of lagers (and London Pride on draught tap), which can be hired out for functions. Thai food is served noon-3pm and 6:30pm-10pm Monday to Friday, but not on Saturday. Last visited by Ewan, Jo and others, 7 February 2009. Opening hours taken from Fuller's website, April 2008. Last edited 2013-05-10 08:06:42 (version 9; diff). List all versions. Page last edited 2013-05-10 08:06:42 (version 9).